FILEminimizer is an amazing app that reduces / optimizes the size of Word, PowerPoint, and Excel files without changing their formats. 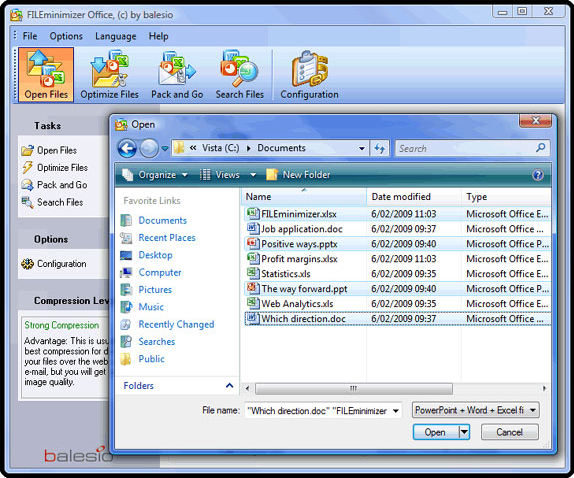 The reduced versions of these files can be opened and viewed just like the originals, with no unzipping (no zip or rar archives are created) or decompression required. Sure, I can hear you say, FILEminimizer makes my files smaller, but it can't be THAT good, can it? Eat those words! FILEminimizer lives up to its name by featuring file reduction of up to 98%! A 50Mb file shrinks to less than 1Mb! The software uses an intelligent optimization technique which reduces / optimizes pictures and embedded objects without negatively impacting the original file format and quality. FILEminimizer Office v7.0 for PC - Next 24 Hours.